The Boar's Hair Detailing Brush is a versatile cleaning tool that can help you clean your vehicle's wheels, interior, trim pieces, joints, seams, seats, console, buttons, emblems and so much more. This high quality boar's hair brush really has an endless amount of uses which makes it a must have tool for any detailer. It's a gentle yet effective cleaning tool you can use on factory wheels and even the most delicate after market wheels. The extremely soft fibers allow it to break up contaminants in tough to reach areas while never scratching or marring the wheel. It works great in between spokes, around lug nuts, rivets, lips, etc. so you can safely clean even the most challenging areas. For the exterior trim you can now clean the emblem, grill, seams, vinyl trim, bumpers, etc. Some of these areas previously appeared impossible to clean but the Boar's Hair Detailing Brush makes this possible. Last but not least use this brush all over the interior to remove dust from areas such as the vents, shifter knob, buttons, console, trim pieces, seats and so much more. It's truly a very unique and high quality brush that can be used inside and outside of your vehicle for top notch detailing work. Pick one or more up today and you'll be amazed at how helpful this tool is. 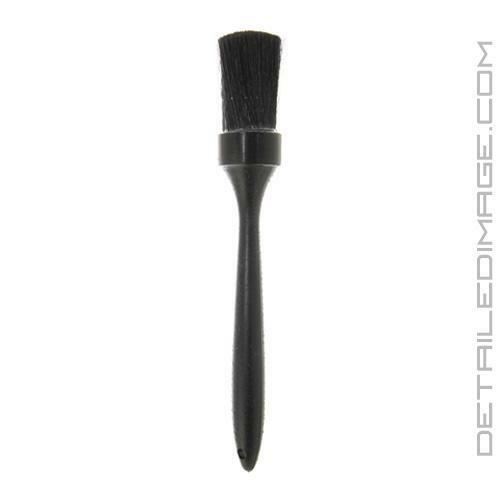 The DI Boar's Hair Brush is a staple in my detailing arsenal, I have three. One of these brushes is delegated for interior work, the second is for wheels, and the final one I use on trim and emblems. All in all, the DI Boar's Hair Detailing Brush is one of those must-have tools because it can be used for various tasks and does a great job each and every time. Highly recommended! This is high quality product. It's very helpful to have one for your car detailing. I ordered this brush as a backup for my lugnut brush, but I wound up designating it for interior use! It is a great brush to use for agitating a foaming interior cleaner into leather seats and plastic pieces. A few hairs have come out but that is to be expected when you're agitating a surface. Two thumbs up to DI! Use on wheel lug nuts because it is soft enough for even expensive wheels and does a great job.